When we were at Sweet Suite this year we were very excited about all the things being shown at the Crayola table. If you know me than you know that we are a Crayola only house. I do not allow other crayons in the house. It is Crayola or nothing. So I am fiercely loyal to the brand and I love to promote their products. I have the chance today to talk about the new Scribble Scrubbie Pets. We saw this and got to play with this at Sweet Suite. Andrew had a great time coloring the pets. Did I get any actual photos of this, no. I was all over the place that day. I have video of him playing with another Crayola product and the Scribble Scrubbie pets are in the background. We did receive our own set to check out prior to the twitter Party today. Yes, you can win some of the great Scribble Scrubbie Pets products. All you have to do is RSVP for the party through this link http://bit.ly/ScribbleScrubRSVP. 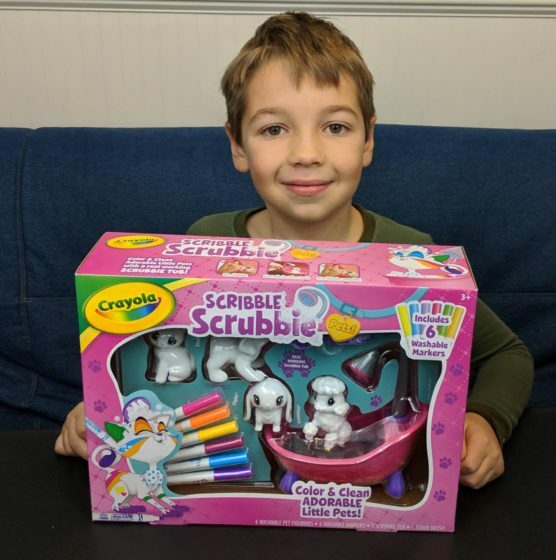 There will be plenty of chances to win your own Scribble Scrubbie Pets and the Grand Prize includes the Scribble Scrubbie Pets and three additional accessory packs that feature even more pets! The Scribble Scrubbie Pets! Scrub Tub Playset is a HOT item! The Crayola website has them totally sold out right now. So, if you are interested in picking this up for one of your loved ones then your best bet is to come to the Twitter Party today at 11:00am EST. There are several pets like dogs, cats and bunnies. They are fuzzy and you can color one them but you can also wash the color off completely as long as you use the Scribble Scrubbie washable markers and you do not press too hard when you color. We saw this in action and it is really amazing. The Scribble Scrubbie Pets! 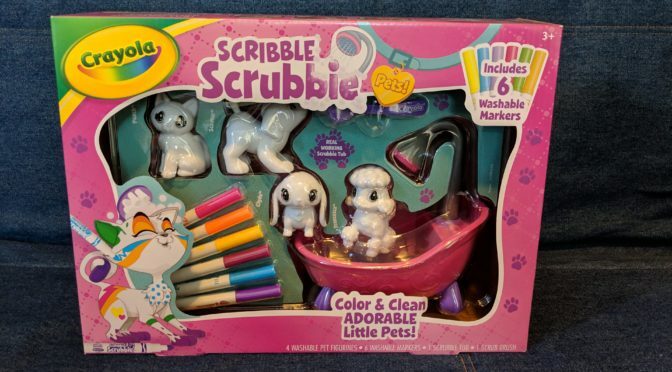 Scrub Tub Playset comes with 4 pets and the tub plus six Scribble Scrubbie markers and a scrub brush. Everything you need to have a fun afternoon. Just add water. With expansion packs you can collect up to 12 different pets and additional colors of markers. So please join me and @TheToyInsider, @Crayola plus my fellow panelists , @charlenedeloach, @savingmichele, @lovepeacemommy, and @suburbanwifedp. Mix & Mash Eggs, Fluffy Cloudz and Surprise Eggs Slime from We Cool Are Great for Easter Baskets!